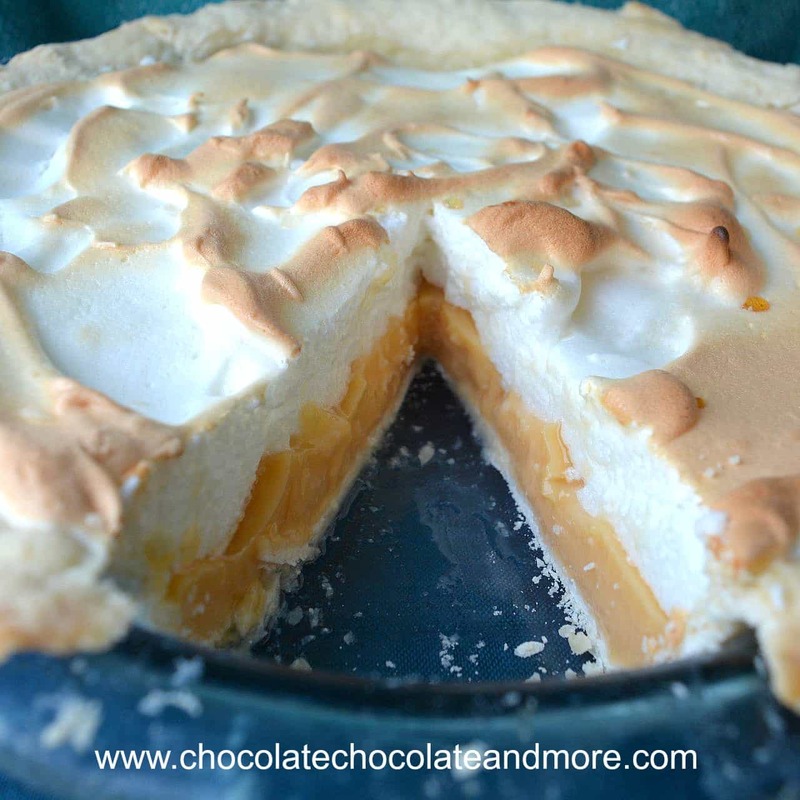 Mango Meringue Pie - Chocolate Chocolate and More! Working on getting back into your swimsuit? Mango meringue pie has only 1/4 cup added sugar for the whole pie! A couple of weeks ago I bought a mango at the grocery store. They’re coming back into season and I love them in salads, smoothies, and desserts. This mango was so juicy and sweet that I needed some more. Problem was I’ve been so busy that I haven’t made it back to the grocery store. As I was walking home from the bus stop, I came across a fresh fruit and vegetable stall with …. mangoes! 1 kilo (a little over 2 pounds) for $0.35. As much as I love mangoes, I can’t eat a kilo before they go bad so I tried to negotiate for a couple of mangoes. The seller wouldn’t budge and so I bought 6 mangoes instead of 1 or 2. Then I had a really busy week and didn’t eat much at home. One mango was already spoiled so that left 5 mangoes that needed to be eaten NOW. It so happened that one of my friends asked me to make a last-minute dessert. 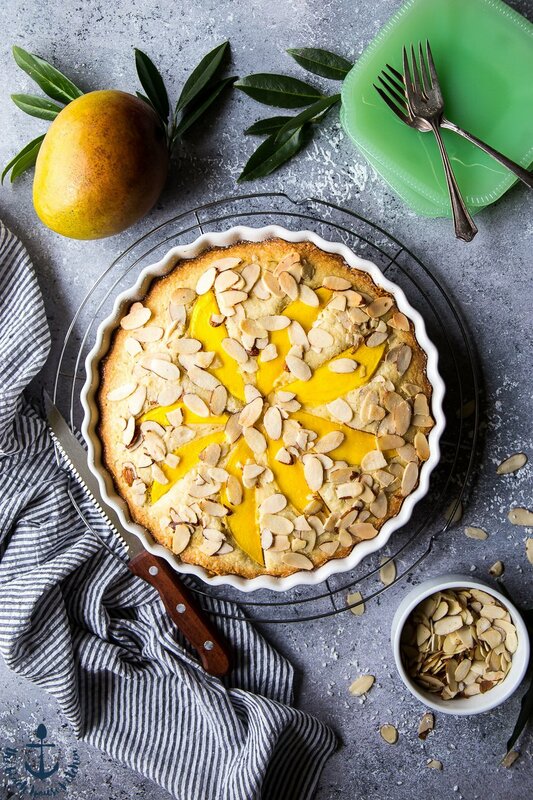 I had some left over pie crust in my fridge and 5 really ripe mangoes – mango meringue pie! You really only need 3 mangoes for this pie. I have about a cup of extra puree sitting in my fridge waiting to be turned into ice-cream sauce. After sampling a little of the puree I realized this pie filling needed no added sugar. In fact, I actually added a little lemon juice to tone down the sweetness. So only the meringue has any sugar. With the added lemon juice, the filling is slightly tart. If you wanted, you could just serve the filling with a little strawberry sauce for a lovely dessert. My friends loved this pie. It was a small party but I only managed to save one slice for the photos and it got a little banged up on the ride home. Roll out pie crust and line the bottom of a pie tin with it. cover the pie crust with baking paper (I cut a square big enough to cover the crust) and fill with dry beans or pie weights. Bake at 375°F for 20 minutes. Remove baking paper and beans. Bake for 5 more minutes. While the pie crust is baking, make the filling. Put the cornstarch in a small saucepan. Gradually add water, whisking to keep lumps from forming. Add the mangoes, lemon juice and butter. Cook over medium heat, stirring until the mixture boils. Continue cooking until it thickens (about twice as thick as it started. About 5 minutes). Remove from the heat. Whisk egg yolks in a bowl. Gradually pour about half of the hot mango mixture into the egg yolks. Whisk the entire time to keep the eggs from cooking. Put the egg mixture back into the pan and whisk everything together. Turn the heat on medium and cook whisking until the mixture boils again. It should turn VERY thick. When you lift the spoon, the filling will drop in balls rather than a stream. Remove from heat. Beat the egg whites until frothy. Add the cream of tarter and continue beating. When the egg whites reach the soft peak stage, add the vanilla and gradually beat in the sugar until stiff peaks form. Pour the mango filling into the baked pie shell. Top with meringue. Bake at 375°F for 5 minutes or until the peaks on the egg whites turn golden brown. Mangoes vary in sweetness so taste your puree to determine if you need lemon juice. You can also taste the filling before you add the butter to make sure you have the right balance. Mangoes also vary in the amount of liquid. More juicy mangoes may make it take longer to thicken up the filling. My mangoes produced a fairly thick puree. If your filling isn't thickening up, add another half tablespoon of cornstarch.